The second article 373 K Superconductors-II is ready. The abstract will be posted soon here. Certainly the Nature can't be fooled and speaks for itself in the 4 videos below . Besides, a classical Cp(T,H) was found in 2016 by an East Coast U. Physics Department group to have a Tc = 366K. The group cut off the large sample shown below in the video on the 5 inch magnet -being reflected from the edge by the large gradient of the central 1.4T magnetic field . Hardly anybody will argue that the future of the computing and the quantum computing in particular is in the Josephson Junctions (JJ) operating at room temperatures. We have demonstrated 5 figures with different JJ in "373K-SUPERCONDUCTORS". By 2016 we had studied several hundreds of JJ and JJ Mesas (JJM). When writing now found a record of a superconductor to normal transition from 2006, November with the zero resistance seen in details for a long time of 8600.17 seconds and the zero starting with a very long zero resistanse (10^(-9)V) line. We may add it and more here. from year 2016" The experimenting with the 373K Superconductors is enjoyable. The exhibits here are changed frequently and the text as well. We may decide to display more about the THz emission intensity, when we have a better understanding of it. Posted are the magnet video, and the signal of the police detector on video of the THz Josephson Junction mesa emission. A new wire blowing video is posted further. The Dominique Radeva video of heating of a superconductor with a torch posted in 2017 is last. New sections with new type of data will be published soon as "373K Superconductors -II ". The unpublished 1996 joint work (name not given to spare dangerous publicity) on Universality in Normal metal- Superconductor (N-S) - nano bridges and Andreev reflection is now removed. Its larger version (not from the slides) with more explanations can be posted when we decide. An early experimental work with colleagues, about our ionic photo effect first ever documented observation is in the few references list. The 1985 Field Theory of Localization and Superconductivity - ICTP publication was independently repeated and published by a Russian group in a PR B article in 2001 and later by many others including in books. I wrote to the authors and they wrote " Much water under the bridge" -why cite it? For other subjects studied, below is the JETP-Letter work -it impressed Mott (NP-1977) and we had a 20 years correspondence with him . The main theoretical idea for a different type of superconductivity was stimulated by our one day talk with him in 1990 in the Mott Building, where he had a very small room, being retired. A framework of this theory was a kind of guide when working experimentally in the years 1997-1998 in a study of several hundreds of various compounds on the way to 373K superconductors. ​The superconductor tape stays intact when the same size connected in series copper tape is blown up by the 137 A high current(110,000A/cm^2). 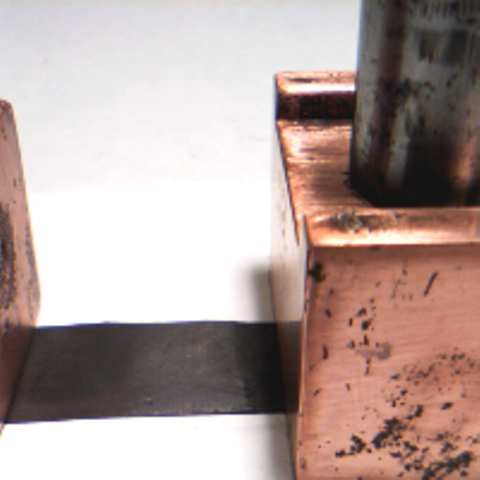 The blown black superconductor layer is about 0.4 mil (10 micrometers) on a copper tape both are about 1.6mil (40 micrometers) thick and about 1/2 inch wide. The copper tape is of the same total length, width and thickness, connected in series, simultaneously passing a 137 A current. The current density in the superconductor part as obtained in this experiment is about 110,000A/cm^2. The technical density is about 3-4 times smaller. Shortly the copper tape is blown up and photographs of both, the set up and the tapes, are shown before and after the blow up. 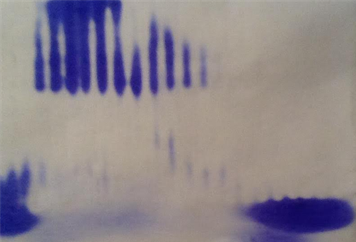 Included is the piece of paper below the tapes with traces of the process. About a previous Avatar picture see: Report On The 2010 Workshop on HTS Wires Dr. Bruce P. Strauss, Office of High Energy Physics U.S. DOE Office of Science. The Avatar picture and other ideas -see the T. Geballe letter in - Stanford University News Service (415) 723-2558,- 1991. For comparison we give the first authentic images of this "Avatar type fiction" material and in particular reflection from the superconductor in the visible light range as compared with a normal metallic mirror (brass type) and a dielectric mirror-Si wafer. More photos may be shown next. In the mentioned above video, is shown a police detector on a copper foil antenna recording only the noise initially. The 3 microwave emissions for 10 seconds each are heard clearly with well separated loud sound. The microwave signal was transmitted via a coaxial cable approximately 10 meters long, Simultaneously produced the emission field image is shown last on the left. The sharp circular edge is formed by 1-2 THz sub - millimeter waves. Two photographs are presenting the THz microwave field in front of a metallic grating. The second photo down on the left have a cleaner rectangular area in the middle. The clean rectangular area can be a suppression of the emission in the central area or it may be a transmission in this area. An other option is frequency range variation. Evidently, the emission can be influenced in one or other way, as expected. . The next bottom left photo show an about 4 cm long cylinder with one contact still attached after passing 2100 A current on July 29, 2012, 3 times for several seconds. It was destroyed later. The small sample is of 1/4 inch diameter and about 0.2 cm thickness. On November 30, 2010 a record high current of 1900 A was passed under compressed copper contacts. All high currents were recorded by the first 2 digits only. At present a precise Ammeter is in operation with a range up to 5000 A, all digits relevant. For comparison - the Columbus, Bixby - American Electric Power station was passing currents in the range of 2000 A for years testing the 3 phase liquid Nitrogen cooled superconductors system. The Fig. 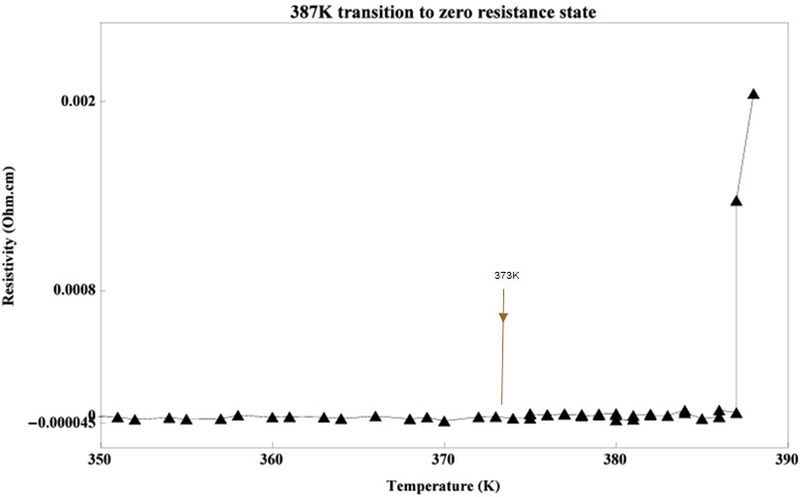 1 from the 373K superconductors paper is shown to mark the position of 100 degrees C and to show also negative voltage. More comments on this subject will come later. When measuring the resistance of very small pieces of Copper with a nano-voltmeter it may also show negative numbers being in the range of its smallest measurable values. A proper earth connection and longer time may help to get positive readings. There are also other causes of the negative readings, which we may comment later. In general, in a quantum state with a precisely given current the voltage is in-determined as the two operators (current and voltage) form a pair of non-commuting quantum variables and for very small values this becomes important. 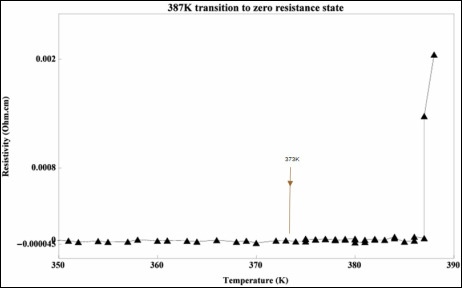 After heating the sample to above the critical temperature the resistance is seen to appear, the sample definitely not being in a quantum state. The photo at the bottom right shows a 3 inch diameter magnet with a field of 1.4 T in the center. The superconductor pellet in the form of a 3/4 inch diameter disk is suspended below the magnet. 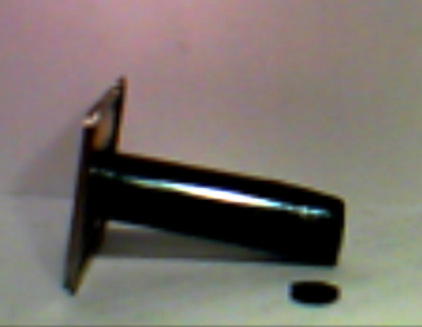 The pellet is attracted to the magnet due to super-currents, and suspends below the surface of the magnet due to gravity. If the magnet is rotated the pellet moves without friction (not counting the existing air friction ) and remains below the magnet, at a minimum energy position. 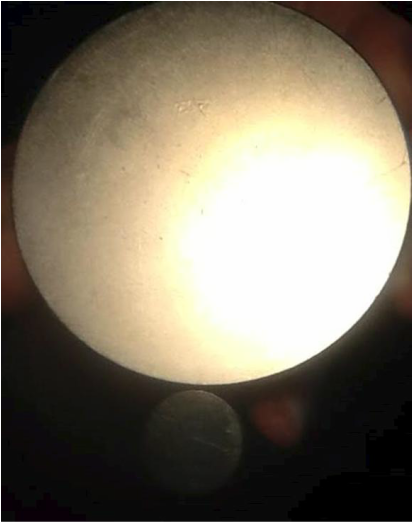 On the right is the photo of an upright superconductor sample on the same 3 inch diameter magnet with about 1.4 T magnetic filed near the center. On the left is an other one below the same magnet. . The photo on the top right shows solar light reflection from three objects of different nature. The largest is a metallic brass type mirror. 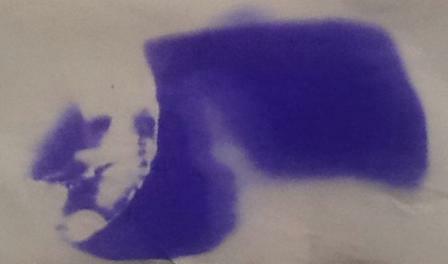 The darker middle sized object is a Si wafer - a dielectric mirror. In the center is a mirror reflecting the solar light. It is the same 3/4 inch superconductor, which is suspended under the magnet at the bottom right photograph. The photo on the left below is the same 3 objects in a closeup view, showing for comparison the image of the back surface of an ipad illuminated by the reflected from the mirrors light. " 1.Manuscript.-arXiv:1603.01482v1 [physics.gen-ph] 4 Mar 2016, for the presented Shapiro Steps see Shapiro Steps in the Absence of Microwave Radiation-arXiv:1107.0061. and p.37 of the thesis "Superconductive Effects in Thin Cluster Films" by J. A. H. Grigg, University of Canterbury, 2012 and many others (google), also the more proper name Self Induced Shapiro Steps on p.14 of the paper: arXiv:1603.09611v1 [cond-mat.mes-hall] 31 Mar 2016. 2. Ivan Z. Kostadinov and Bruce R. Patton, Second Critical Point in First Order Metal-Insulator Transitions, Phys. Rev. Lett. 101, 226407 (2008). 3.Field Theory of Localization and Superconductivity, preprint IC/85/238. I.Z.Kostadinov - Trieste,1985. 4.On the Asymptotic Behaviour of the Conductivity in Disordered Structures. I.Z. Kostadinov,JETP Letters 14, 345-348 (1971)(in Russian) . In the above video -audio-here we show the police detector and the end of a coaxial cable attached to the large current emitting JJ. The detector records some noise and next is a strong emission -3 times-to imitate Morse signals. It is then again repeated twice. Below is the video of passing 147 A current via a superconductor tape and a copper tape of the same size-length, width and thickness. 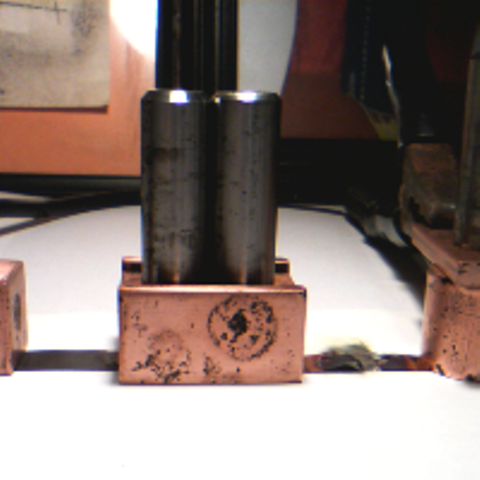 The copper tape blows up and the superconductor tape is intact. Only the surface of the superconductor tape is passing the current, the superconductor being deposited on the same type copper tape and then is processed to the same thickness as the standard commercial tape. In fact the active superconductor is about 1/4 of the copper tape thickness. 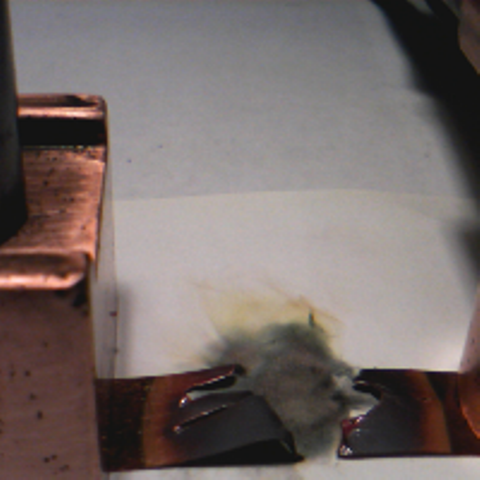 The blown up copper tape is shown lower as well as the intact superconductor tape. year 2017"Below we posted the Dominique Radeva video of several 373K superconducting pellets on top of the same magnet as shown above in video 1, Now the magnet is positioned under the heat insulators . One of the samples is heated with a torch until its magnetic moment, due to the induced surface super-currents, vanishes. 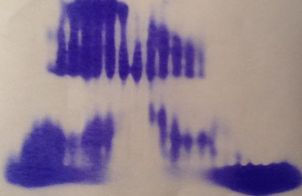 When cooled down it springs up again..One can see that the sample had to be overheated to red hot to get it horizontal. One reason for overheating are the small grains near the surface of the magnet being harder to cool. Another is the cooling due to evaporation..of the red hot part."